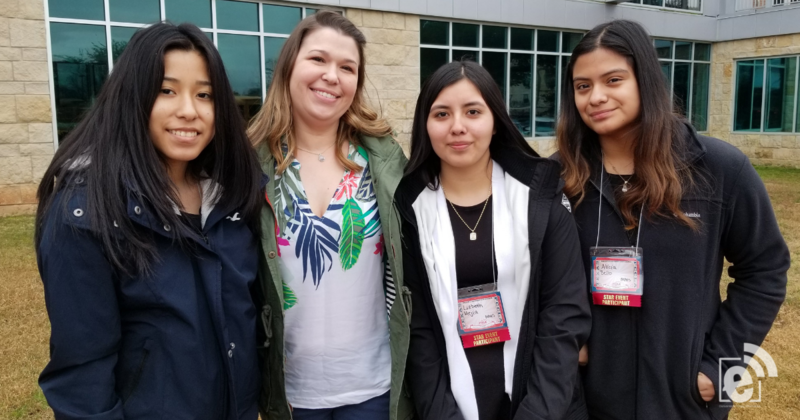 The Mount Pleasant High School chapter of FCCLA (Family, Career, and Community Leaders of America) competed at the Region III meeting in Waco, Texas on Friday, February 8. Five students will move on to the State competition in April. The team of Alicia Bello, Lizbeth Mejia, and Samanta Garcia competed in Life Event Planning. For their project, they planned and organized a baby shower. They came up with a theme, invitations and had to stay within a budget. They placed fifth and will be moving on to State competition. Ashley Rodriguez and Lauren Southerland received bronze medals for their efforts in Education and Training FCS-Assessments. Rodriguez and Southerland will be taking another assessment at the State level in Child Development to extend their professional portfolios. Two MPHS teams competed in the Culinary Arts competition. In teams of three, these students prepared a meal consisting of Caprese salad with tomatoes and toasted baguettes with guacamole topped with sautéed shrimp. For the entrée, the culinary teams prepared sautéed chicken over fettuccini with a basil cream sauce, and for dessert, Rocky Road mousse. The students competed against 30 other teams from all over the region. Although they did not advance to state competition, they received $500.00 scholarships and gained skills and comradery within the culinary community as a result of their efforts. Team members included Matt Braudaway, Hunter Tigert and Angel Reyes, and Andrea Flores, Jaquelin Vazquez, and Tyrese Milton. FCCLA sponsors are Sweeden, Margaret Bradley, and Chef Kathleen Miller-Hayes.